FALL IN LOVE! 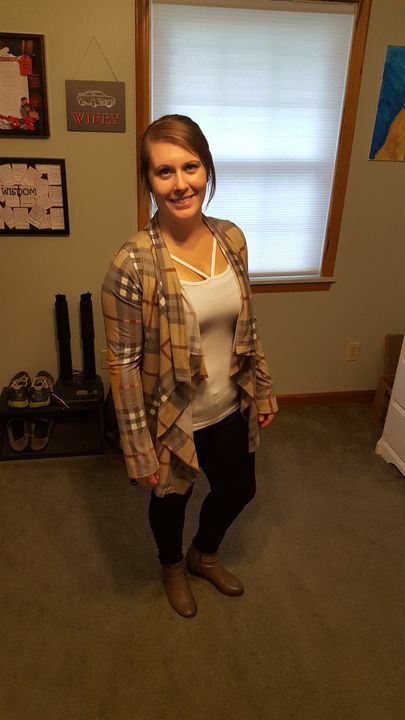 We love this Mocha Plaid Cardigan with Elbow Patches! Pair it with anything - jeans, leggings, tops, and accessories! It’s such an easy to wear style and features the cutest elbow patches. Super cute, comfy, and well made. Delivery was on time also. size was accurate and loved the color! Never been disappointed with anything I’ve bought from Saved By The Dress! Went by the size chart and followed it to a T. I thought the elbow pads were going to be like a faux leather material, but it’s actually suede and you can’t even tell it’s there, which I love. Love this cardigan! I get many compliments whenever I wear it! I'm taking one star away because the sizing is slightly off. If you're in between sizes, size up. Mine fits, its just a little more snug on my arms than I'd normally choose.